Sometimes a number is so big (or so small), that it takes a while to write it all down. Luckily, this number can be written quicker using scientific notation! Watch this tutorial and learn about scientific notation. How Do You Multiply Two Numbers Using Scientific Notation? Multiplying together two really large numbers? What about two really small numbers? How about one of each? 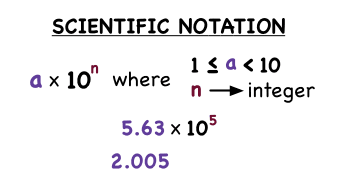 Scientific notation to the rescue! Watch this tutorial and learn how to multiply using scientific notation. How Do You Convert From Decimal Notation to Scientific Notation? Trying to convert a really large or really small number to scientific notation? Watch this tutorial and you'll be a pro in no time! How Do You Convert From Scientific Notation to Decimal Notation? Trying to convert a number in scientific notation to decimal notation? Watch this tutorial and you'll be a pro in no time!